Why broadcasters are launching multiple Hindi general entertainment channels. When Star India started Life Ok, its second Hindi general entertainment channel (GEC), in December 2011, there were many doubting Thomases. With eight Hindi GECs already in the fray, wasn't the market too crowded? Just three years before, five new Hindi GECs had been launched - Colors, 9X, ZeeNext, Real and Imagine - of which only the first survived. Star India's own experience with an earlier complementary Hindi GEC, Star One, had been far from happy, the channel finally being shut down, while a third similar channel, Star Utsav, was merely limping along. "The brief given to us was to create a channel parallel to Star Plus," says Ajit Thakur, General Manager and Business Head, Life Ok. "We had to find our own agenda and our own content." Yet Life Ok scored. In September this year it was the fourth most popular Hindi GEC with a television viewership per thousand viewers, or TVT, of 313 behind only Star Plus, Colors and Zee. Was Life Ok a freak success or will it be a trendsetter? With three new Hindi GECs launched recently by broadcasting heavyweights, the question is being increasingly asked. 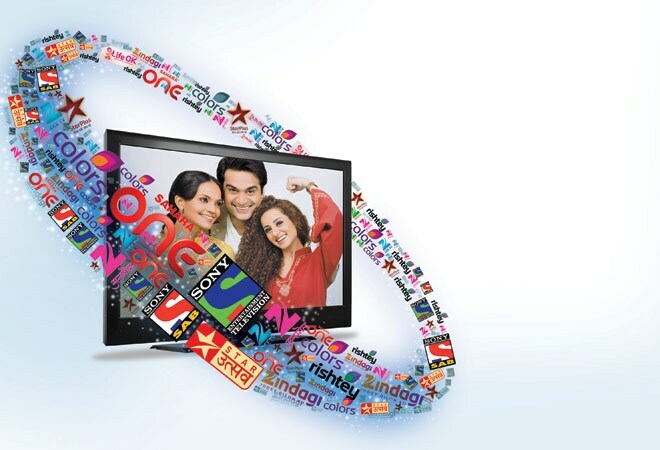 Viacom 18 Media Pvt Ltd, which runs Colors, launched Rishtey in March this year; Zee Entertainment Enterprises Ltd (Zee TV) began Zindagi in June, while Multi Screen Media Pvt Ltd (MSM), which owns the Sony channels, started Sony Pal on September 1. With these additions, there are now a dozen Hindi GECs competing, while a 13th, a third one from the Zee stable to be called "&", is slated for a December entry. Only five are profitable currently: Star Plus, Colors, Zee, Life Ok and Sab TV (owned by MSM). Ironically MSM's flagship Sony channel is not in the profitable list. How realistic are the newcomers' hopes of making a dent? One vital difference between the scenario in 2008/09 and the present is of course digitisation. The earlier analog bandwidth was limited, which gave distributors the upper hand, as they had it in their power to decide which channels reached customers' homes. Broadcasters paid ever increasing 'carriage fees' - as such payment is called - to appease them. NDTV and Turner Broadcasting are said to have paid more than Rs 60 crore in carriage fees for Imagine and Real, respectively, which may well be one of the reasons why both channels proved short-lived. (Carriage fee was one of the reasons, their content strategy also didn't work.) But now digitisation has provided the alternative of direct-to-home (DTH) broadcast, which has reduced carriage fees by 15 to 20 per cent and made the launch of new channels more affordable. Besides, the market is growing. Television in India currently reaches 139 million homes by cable or DTH broadcast, which is expected to rise to 180 million homes by 2018. Around 30 per cent of this viewership watches Hindi GECs. Indeed, some of the second channels in this category are growing faster than their flagship counterparts, albeit from a lower viewership base. A survey by ad agency DDB Mudra shows that while Star Plus grew 11 per cent (between 2011 and 2013), Life Ok rose 21 per cent. Similarly, while Sab TV viewers increased 58 per cent, flagship Sony watchers did so only nine per cent. "There is always space for quality content," says N.P. Singh, CEO, MSM. "As long as you deliver good content, I don't believe there will be clutter." Broadcasters also take heart from the fact that the average time per day spent watching TV in India is three hours, while in the US it is six hours. "The national average may be three hours, but in the metros it is about four," says Sudhanshu Vats, CEO, Viacom 18. "This is despite the many other entertainment options in metros. It shows there is a lot of scope left for TV." To enhance their appeal, however, broadcasters are also identifying and nurturing specific segments within the Hindi GEC viewership. In Star India's bouquet of channels, for instance, Star Plus has a preponderance of family dramas which target women, while Life Ok has a sizeable number of crime-related programmes - Savdhan India, Super Cops, etc. - which seek to draw male viewership. While MSM's Sony is the usual, broad based (which targets a more metro-centric audience) Hindi GEC, Sab TV features mainly comedy shows. Indeed, after MSM bought Sab TV from the Adhikari Brothers in 2005, it had attempted to make it a clone of the flagship, which didn't work. With a return to comedy of the kind the whole family can watch in 2008, its gross rating point, or GRP, soared from 23 to 150. 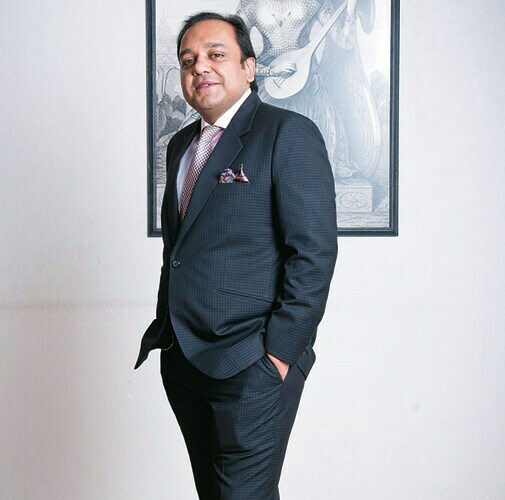 "Fragmentation is the order of the day," says Punit Goenka, Managing Director, Zee Entertainment. "With the emergence of multiple screens, including tablets and smartphones, there is an opportunity to offer segmented content." Thus two of the three new Hindi GEC channels have a fairly sharp focus. Zee Entertainment's Zindagi is targeting the metros, airing syndicated content from Pakistan. In coming days, it hopes to bring in programmes from Bangladesh, Sri Lanka, Egypt as well as Turkey. Its forthcoming channel "&" will focus on youth and male audiences. MSM's Sony Pal is aiming at small town women. Only Viacom 18's Rishtey has had content transferred to it from sister channels Colors, Nick and MTV, including well known ones like Big Boss and 24. The channels launched in 2008/09 made no effort at such segmentation. "They tried to rival the existing GECs and fought for the same market share. This time the new channels are not doing so but are creating niches," says Sameer Nair, Group CEO, Balaji Telefilms, who earlier headed both Star India and Imagine. It will also help that the new entrants are backed by established players with deep pockets. In 2008, 9X was a start-up with venture capital funding, while neither NDTV nor Turner Broadcasting had previous experience of the general entertainment business in India. Catching eyeballs is one thing, the bottom line another. How profitable are the new Hindi GECs likely to be? The average soap opera costs between Rs 10 lakh and Rs 15 lakh per episode today, but high concept ones such as Colors's 24 or Sony's Yudh - which featured Amitabh Bachchan as a TV actor for the first time - can consume up to Rs 2 crore. Even a popular show such as Big Boss became profitable only last year, according to insiders, because of the filming expenses, while Yudh, which has had dismal ratings, is said to have burnt a big hole in MSM's pocket. Thus one strategy could be to curtail spend on the second - or third, in Zee Entertainment's case - channel. A successful example is Sab TV, which chooses not to use well known or expensive actors in its shows. "The second channel either uses library content from its flagship channel or keeps the content cost significantly lower," says Smita Jha, Leader (Media and Entertainment Practice), PricewaterhouseCoopers. Among the new ones, Zindagi, which uses syndicated content, has about 15 to 20 per cent lower costs than flagship Zee TV. The broadcasting companies, however, hotly deny any cost cutting. "The second channel needs to have the ambition of becoming as big as the flagship," says Thakur of Life Ok. "The investments also have to be big. If you think of yourself as a 'second' channel you will never succeed. We compete with Star Plus as much as we do with Colors." Zee Entertainment's Goenka too, while conceding Zindagi programmes cost less, maintained expenditure on the third channel "&" will be as lavish as on the flagship. What they refrained from mentioning, however, is that the duration of original content beamed per day on the second Hindi GEC is often smaller than on the flagship one, which helps to keep costs in check. Life Ok and Sony Pal do three to four hours of original programming daily against six to seven hours by their flagships, Star Plus and Sony, respectively. "With content, there is always risk," says Viacom 18's Vats. "But if you hedge the risks and do things in a calibrated fashion, you are safe." Colors, despite its early success, took four years to turn profitable. One factor which has made the road to profitability more difficult for TV channels is that digitisation has not helped to the extent they had hoped. Most expected almost 50 per cent of their customer-sourced revenue to come from subscriptions after compulsory digitisation was rolled out in phases from 2012, but the share is currently around 35 per cent. For the rest, they still have to depend on cable operators, who continue to declare fewer viewers than they actually cater to and thereby pay the broadcasting companies less than they should. With the third and fourth phases of digitisation now pushed to 2015, robust subscription revenue is still far away. "Digitisation in its true form is yet to be seen on the ground," says MSM's Singh. Around 30 per cent of these viewers watch Hindi GECs, which also generate 27.1 per cent - the largest chunk - of the total ad revenue - Rs 13,600 crore in 2013/14. So, most TV channel revenues come not from customers but from ads. 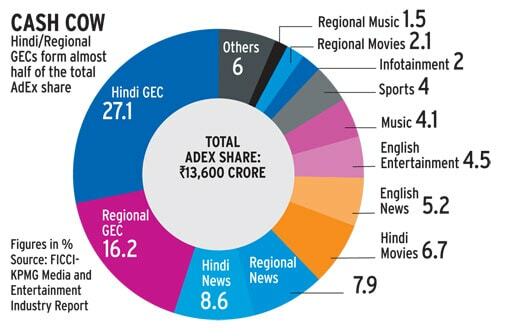 The main reason broadcasters launch more than one Hindi GEC is because it is these channels which draw the most ad revenue. Will the new ones get enough ads? Opinion is divided. More channels mean more programmes and thus more inventory for broadcasters to monetise. "If a network has a flagship channel with a GRP of say 250, and a second, similar one with a GRP of 100, it could argue with advertisers that it actually commands 350 GRP and could provide wider reach for their brands," says Jha of PwC. The segmentation the Hindi GEC broadcasters are focusing on will also help. "Advertisers are looking for vehicles which help them reach the audience they want," says MSM's Singh. "In our case, Sony Pal will get them women audiences more effectively, while we already have two other Hindi GECs to reach men and the family." Already women-centric Star Plus gets large numbers of ads for fast moving consumer goods, while sister channel Life Ok, with its male focus, gets many auto and mobile phone ads. But there are hurdles too. Last year, the Telecom Regulatory Authority of India capped the length of advertising allowed on a show at 12 minutes per hour. To compensate, TV channels have raised ad rates, which in turn has made advertisers much more careful about where they place their ads. "New channels certainly help networks target additional revenue. But how much really accrues needs to be watched, since advertising budgets are limited and GRP targets are also finite. Unless new advertising segments are roped in, it will be difficult for the new channels to gain substantial revenues in the next few months," says Sathyamurthy Namakkal, Executive Director, DDB Mudra Group, and President, DDB MudraMax. Mallikarjun Das, CEO of media planning agency Starcom MediaVest, agrees. "It will be all the more challenging for the new channels at a time when consumption of the same content they broadcast is happening on various digital platforms as well where a robust monetising mechanism is yet to be put in place." But he also adds differentiation will help. "What works in their favour is that a lot of media planners take gut calls too, outside of numbers." What is the report card on the new channels so far? Rishtey seems to be ahead with a TVT of 46. Sony Pal, less than a month old, is at a mere 20, while Zindagi stands at 30.